New Year’s Day – in Edmonton and its surrounding region the daylight hours of 2013 are sun-filled against a backdrop of blue sky. I’m out, looking around at the world with my camera, making my way from Edmonton’s west end, through its University area and Whyte Avenue. My wife, daughter and son are at my brother’s home reading … and there’s some baking going on. I have some of the day with my camera. The Edmonton Clinic at the University of Alberta reveals itself to be something eye-catching when complete – a longish curve of glass that will stretch for a city block in length and upwards about eight stories; the building will be about reflection as much as the glass permits a looking in on all that’s going on. But, the photo is not for today; the construction is still in progress and from the best angle impedes what is likely the best shot. The day does hold its share of shots as I move to the Molson Brewery site that’s being dismantled. Then, it’s out to St. Albert to Edmonton’s northwest. My wife has recalled our seeing grain elevators as we drove into St. Albert last summer for a huge farmer’s market and she recommends searching for them. 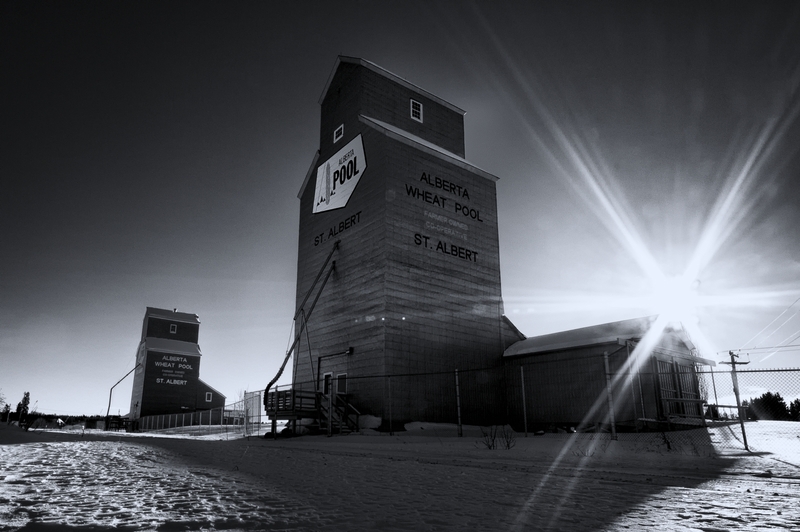 I have a look and discover that the grain elevators are part of a heritage museum in St. Albert. The elevators are behind chain-link fence, yet I can still photograph them. I move from St. Albert west towards Spruce Grove. I use an elasticized, nylon tow rope to pull out someone in a silver, Dodge Dakota whose slid into a country ditch with the snow. On this road are many old farms and farm structures to photograph. But, at this time of day with an upcoming get family together this part of the day is about scouting visually for possible shots … for next time. Listening to – Paul Gross and the Due South soundtrack. Did you use a lens for the starburst effect, or was it happenstance? Looks great, either way. The starburst is the sun coming through a UV filter into my Sigma 10-20mm lens; the starburst is probably shaped by the leaves of the shutter … I’m guessing. I took about 10 shots in the same area and incorporate the sun in half of them. Thanks for answering my question. I’m just starting back into photography. I’ve forgotten so much! Thank you for your kind words; despite the cold people were walking and running past the grain elevators on New Year’s day.